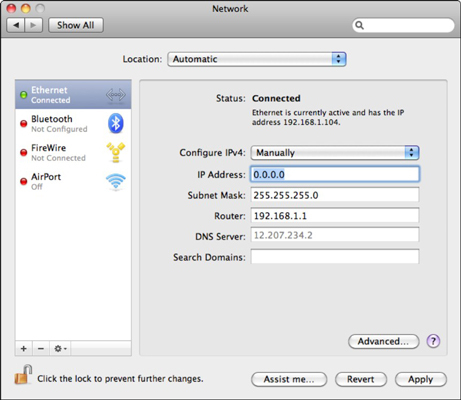 When you set up your Mac network or enable Internet sharing on Mac OS X Snow Leopard, you may need to manually assign IP addresses. It is best to use IP addresses in the 192.168.x.x range. The 192.168.x.x range is the most popular and the most common default on Ethernet network hardware. Use IP addresses where the first two octets are 192 and 168 (192.168). For the third octet, select any number between 1 and 254. It doesn’t matter which one you choose as long as you use this same third number on all computers on your network. For the fourth octet, select any number between 1 and 254. Make sure that every computer on your local network has a different fourth octet number. This is very important — your network doesn’t work otherwise. Use 255.255.255.0 as your subnet mask. 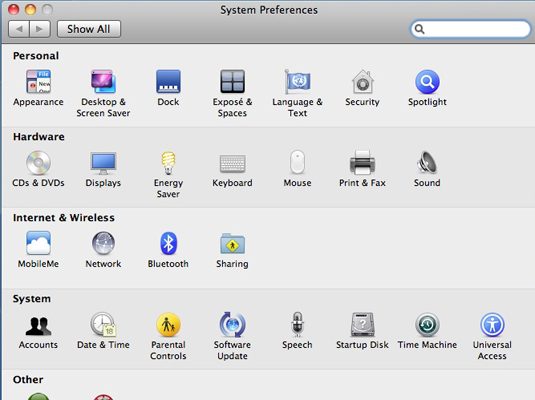 Select any of your Macs to start with and open System Preferences (either from the Apple menu or from the Dock). The System Preferences dialog appears. 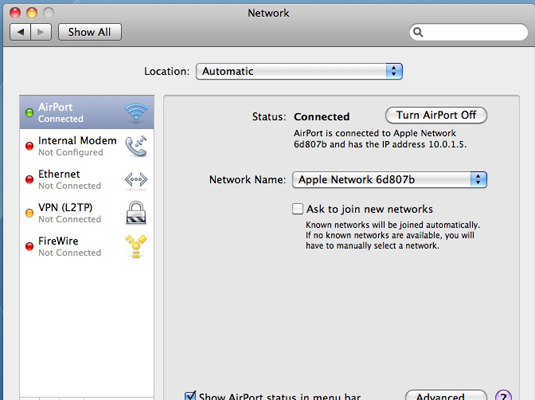 From the System Preferences dialog, choose Network. Click Ethernet in the list. 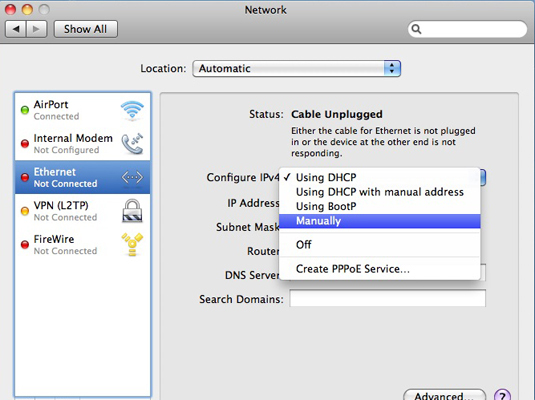 Click the Configure IPv4 pop-up menu and choose Manually. Enter the IP address for this machine (192.168.123.105 in this example) in the IP Address text box. Enter the subnet mask of 255.255.255.0 in the Subnet Mask text box. If you’re using a router or hardware Internet sharing device, enter the IP address used by the router in the Router text box. This is how things should look at this point. Click the Apply button, and your new network settings take effect. Press Command+Q to quit System Preferences. Repeat this same procedure with the other IP addresses for each of the other Macs that are connected to your network. Most ISPs also supply DNS server addresses and search domains. If your ISP included DNS server addresses or search domains, don’t forget to type them into the corresponding boxes on the TCP/IP panel.